This management agreement form is designed to document the management of a doctor group practicing medicine which is managed by a medical practice management firm. This agreement was drafted for a radiology oncology practice, but would be suitable for a doctor manager relationship for any medical specialty. The management company's fee is a percentage of the EBITDA produced by the doctor group. EBITDA (Earnings Before Interest, Taxes, Depreciation, and Amortization) represents the cash flow from the practice. The practice of medicine is left to the physician group under the agreement. 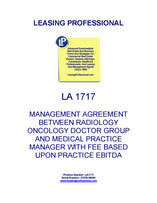 THIS MANAGEMENT SERVICES AGREEMENT (this "Agreement"), dated as of ____________, 20__ (the "Effective Date "), is by and between Medical Practice Management, a _________ corporation ("MPM" or "Company") and Radiology Oncology Physicians, Inc., a _________ professional corporation (the "Practice"). A. The Practice is a medical practice that provides Radiation Oncology Services (as defined herein) in the State of _________. B. The Company is in the business of providing certain administrative and support services to medical practices, and in providing administrative and clinical staff, space, equipment, furnishings, supplies and inventory to medical practices in connection therewith. C. The Practice desires to retain the Company to provide, on an exclusive basis, administrative and support services to the Practice, and administrative and clinical staff, space, equipment, furnishings, supplies and inventory to the Practice, so as to permit the Practice to devote its efforts to the rendering of medical services at the Clinics (as defined herein). SECTION 1.1 Definitions. As used in this Agreement, the following terms have the meanings set forth below. "ACCC" shall mean the Association of Community Cancer Centers. "Accountants" shall have the meaning set forth in Section 4.5. "ACR" shall mean the American College of Radiology. "Administrative Employees" shall have the meaning in Section 2.6(a). "Affiliate" shall mean (a) with respect to an individual, any member of such individual’s family residing in the same household; (b) with respect to an entity: (i) any executive officer, manager, director, partner or Person that owns ten percent (10%) or more of the outstanding Capital Stock of or in such entity, or (ii) any brother, sister, brother-in-law, sister-in-law, lineal descendant or ancestor of any executive officer, manager, director, partner or Person that owns ten percent (10%) or more of the outstanding Capital Stock of or in such entity; and (c) with respect to a Person, any Person which directly or indirectly, through one or more intermediaries, controls, is controlled by, or is under common control with such Person or entity. For purposes of this definition, "control" (including with correlative meanings, the terms "controlling", "controlled by" and under "common control with") means the possession, directly or indirectly, of the power to direct or cause the direction of the management and policies of a Person, whether through the ownership of voting securities, by contract or otherwise. For the purposes of this Agreement, neither the Practice nor any of the Physicians shall be deemed Affiliates of the Company. "Agreement" shall mean this Agreement, as amended, modified or supplemented from time to time in accordance with the terms hereof, together with any exhibits, schedules or other attachments thereto. "Annual Budget" shall have the meaning set forth in Section 2.3. "Billing and Collection Fee" shall have the meaning set forth in Section 4.1(a)(i). "Business Day" shall mean a day (other than a Saturday or Sunday), on which commercial banks are open for business in ___________, _________. "Business Office Services" shall have the meaning set forth in Section 2.4.
and (ii) any future clinics owned or operated by the Company that is located in the Communities, or upon which the Parties mutually agree. "Clinical Employees" shall have the meaning set forth in Section 2.6(a). "CMS" shall mean the Centers for Medicare and Medicaid Services, an agency of the United States Department of Health and Human Services, and any successor thereto. "Collateral" shall have the meaning set forth in Section 4.6(a). "Communities" shall mean the cities of ____________________________________________________________________, each located in the State of _________. "Company Account" shall have the meaning set forth in Section 4.7. (f) such other costs and expenses expressly set forth in the Annual Budget as Company Expenses. For purposes of this definition, the term "Company" shall mean, collectively, the Company and its Affiliates. "Company Indemnitees" shall have the meaning set forth in Section 8.4(a). "Company Lender" shall mean any Person that makes funds available to the Company or any Affiliate of the Company to borrow (including, without limitation, __________ and _________________). "Company Lender Loan" shall mean any loan agreement between the Company or any Affiliates and a Company Lender. "Company Taxes" shall have the meaning set forth in Section 7.2(a). "Confidential Information and Trade Secrets" shall mean (a) the material terms of this Agreement or any other written agreement between the Parties, and (b) any confidential or secret information concerning (i) any trade secrets, new product developments, special or unique processes or methods of the Company or any of its Affiliates or of the Practice or any of its Affiliates, as the case may be, (ii) any sales, advertising or other concepts or plans of the Company or any of its Affiliates or of the Practice or any of its Affiliates, as the case may be, (c) records (other than patient medical records), patient lists, reports and other documents pertaining to the Management Services, (d) the systems, protocols, policies, procedures, manuals, reports, data bases, documents, instruments and other materials used by the Company or any of its Affiliates or by the Practice or any of its Affiliates, as the case may be, (e) all other professional or business information developed by or on behalf of the Company or any of its Affiliates or by the Practice or any of its Affiliates, as the case may be, including items produced by the Physicians, and (f) all financial statements and reports produced by the Company or any of its Affiliates or by the Practice or any of its Affiliates in connection with this Agreement. "Depository Bank" shall mean _________ Bank. "EBITDA" shall mean Net Income before interest expense, taxes, depreciation and amortization. "Event of Default" shall have the meaning set forth in Section 5.2. "FF&E" shall have the meaning set forth in Section 2.2(a). "Financial Statements" shall have the meaning set forth in Section 2.5. "GAAP" shall mean U.S. generally accepted accounting principles and practices set forth in the opinions and pronouncements of the Accounting Principles Board and the American Institute of Certified Public Accountants and statements and pronouncements of the Financial Accounting Standards Board or in such other statements by such other entity as may be approved by a majority of the accounting profession that are applicable to the circumstances as of the date of determination. "General Management Services Fee" shall have the meaning set forth in Section 4.1(a)(ii). "Government Receivables" shall mean all accounts receivable generated from services rendered to beneficiaries under the Medicare, Medicaid and other state and federal programs, which services are reimbursable under any of such programs. "Governmental Authority" shall mean any (a) federal, state, city, local or municipal government (or any political subdivision of any thereof), or (b) governmental or quasi-governmental authority exercising any statutory, administrative, arbitral, judicial, legislative, police, regulatory, or taxing authority or power. "HIPAA" shall mean the Health Insurance Portability and Accountability Act of 1996, as amended. "Indemnified Party" shall have the meaning set forth in Section 8.5. "Indemnifying Party" shall have the meaning set forth in Section 8.5. "JCAHO" shall mean the Joint Commission on the Accreditation of Healthcare Organizations. "Law" shall mean any statute, ordinance, code, rule, regulation or court order enacted, adopted or promulgated by any Governmental Authority. "Lease" shall have the meaning set forth in Section 2.7. "Lien" shall mean any security agreement, financing statement (whether or not filed), mortgage, lien (statutory or otherwise), charge, pledge, hypothecation, conditional sales agreement, adverse claim, title retention agreement or other security interest, encumbrance, lien, charge, restrictive agreement, mortgage, deed of trust, indenture, pledge, option, limitation, exception to or other title defect in or on any interest or title of any vendor, lessor, lender or other secured party to or of such Person under any conditional sale, lease, consignment, or bailment given for security purposes, trust receipt or other title retention agreement with respect to any property or asset of such Person, whether direct, indirect, accrued or contingent. "Lockbox Account Agreement" shall have the meaning set forth in Section 4.7. "Loss" shall have the meaning set forth in Section 8.4(a). "Management Services" shall have the meaning set forth in Section 2.1. "Material Adverse Effect" shall mean any event, circumstance or condition that, individually or when aggregated with all other similar events, circumstances or conditions could reasonably be expected to have, or has had, a material adverse effect on (a) the business, property, operations, condition (financial or otherwise), results of operations or prospects of the Company or the Practice, as applicable; or (b) the validity or enforceability of (i) this Agreement or (ii) the rights and remedies of the parties hereunder. For purposes of this Agreement, a Material Adverse Effect shall not include: (A) any change or effect that results from conditions, events or circumstances generally affecting the industries in which the Company or the Practice operates or the economy in general; (B) any action or change specifically permitted or required by the provisions of this Agreement; or (C) the transactions contemplated by this Agreement or the performance hereof. "Medicaid" shall mean, collectively, the healthcare assistance program established by Title XIX of the Social Security Act and any statutes succeeding thereto, and all Laws pertaining to such program including (a) all federal statutes (whether set forth in Title XIX of the Social Security Act or elsewhere) affecting such program; (b) all state statutes and plans for medical assistance enacted in connection with such program and federal rules and regulations promulgated in connection with such program; and (c) all applicable provisions of all rules, regulations, manuals, orders and requirements of all Government Authorities promulgated in connection with such program (whether or not having the force of Law), in each case as the same may be amended, supplemented or otherwise modified from time to time. "Medical Advisory Board" shall mean the board made up of physicians providing radiation oncology services at Clinics operated by the Company or any of its Affiliates. Each physician providing radiation oncology services at one of the Clinics on a full time basis shall be entitled to be a voting member of the Medical Advisory Board at all times during the Term of this Agreement. All costs of the Medical Advisory Board, including but not limited to all costs for Physicians to travel to and attend meetings and otherwise participate in the Medical Advisory Board, shall be Company Expenses. "Medicare" shall mean, collectively, the health insurance program for the aged and disabled established by Title XVIII of the Social Security Act and any statutes succeeding thereto, and all Laws pertaining to such program including (a) all federal statutes (whether set forth in Title XVIII of the Social Security Act or elsewhere) affecting such program; and (b) all applicable provisions of all rules, regulations, manuals, orders and requirements of all Governmental Authorities promulgated in connection with such program (whether or not having the force of Law), in each case as the same may be amended, supplemented or otherwise modified from time to time. "Net Income" shall mean, for any period, an amount equal to Practice Revenues minus Operational Expenses. "New Physician" shall have the meaning set forth in Section 3.7. SECTION 2.1 Management Services. The Company shall provide to the Practice the management services, Personnel, office space, equipment and supplies as set out in this Article II (referred to collectively as the "Management Services"). SECTION 2.2 Furniture, Fixtures, Equipment and Supplies. (a) The Company agrees to provide to the Practice those supplies and items of furniture, fixtures and equipment as are sufficient in nature, quality and quantity for the proper delivery of Radiation Oncology Services to Patients at the Clinics and which are necessary and/or appropriate for the Practice’s operations at the Clinics during the Term, or as are reasonably requested by the Practice, and in each case as are contemplated by the Annual Budget (all such items of furniture, fixtures, equipment and supplies are collectively referred to hereinafter as the "FF&E"). Title to the existing, additional and replacement FF&E shall be in the name of the Company, any Affiliate of the Company, or any of their respective nominees or a leasing company. The Company shall be responsible for ensuring that all (x) Required Improvements and (y) capital improvements to the FF&E that are contemplated by the Annual Budget, are promptly made as may be necessary to maintain the FF&E in good working condition and repair. The cost and expense of such Required Improvements shall be deemed an Operational Expense. (b) The Practice shall not, and shall cause each Physician not to, make any changes, alterations or additions to the FF&E without the prior written consent of the Company, which consent shall not be unreasonably withheld, conditioned or delayed. SECTION 2.3 Financial Planning and Goals. At least thirty (30) days before the beginning of each calendar year during the Term, the Company will prepare, in consultation with the Practice, an annual budget (the "Annual Budget") for the Clinics, reflecting in reasonable detail anticipated revenues and expenses, sources and uses of capital for the Clinics, anticipated Personnel staffing and support services arrangements and anticipated ancillary services for the upcoming calendar year, which budget shall also include an appropriate adjustment for a short calendar year if the Parties anticipate the Term will expire during the calendar year. The parties acknowledge and agree that the initial Annual Budget for the period commencing on the Effective Date and ending on December 31, 20__ is attached hereto as Exhibit B. Each Annual Budget thereafter shall be subject to review and approval of the Practice. In the event that the Company and the Practice are unable to approve any Annual Budget within 15 days before the beginning of the calendar year to which such Annual Budget relates, such dispute shall be settled by the Medical Advisory Board and the Annual Budget in respect of the preceding calendar year shall be annualized, if necessary, and deemed the Annual Budget for such new calendar year pending the determination of the Medical Advisory Board. Neither Party shall be permitted to make any expenditure that is: (a) not included in the Annual Budget if such expenditure is greater than $50,000 individually or in the aggregate with all other expenditures that were not included in the Annual Budget and all other expenditures that exceed their identified amount in the Annual Budget (but only to the extent of such excess); or (b) set forth in the Annual Budget if such expenditure is greater than $50,000 of the amount approved for such expenditure in the Annual Budget individually or in the aggregate with all other expenditures that exceed their identified amount in the Annual Budget (but only to the extent of such excess) and all other expenditures that were not included in the Annual Budget. The Annual Budget for any fiscal year may be amended or modified only by a written agreement executed by each of the Parties. (a) Accounting, bookkeeping and accounts payable processing. (b) Materials management, including purchase and stocking of office and medical supplies at levels reasonably necessary for the provision of Radiation Oncology Services. (c) Human resources management, including recruitment of any necessary additional Clinical Employees and Administrative Employees that are contemplated by the Annual Budget or as mutually agreed by the Parties. (d) Provide qualified support sufficient to assure the proper and efficient functioning of all hardware and software components of the information systems, and medical equipment utilized in connection with the Clinics. (e) Provide financial auditing services reasonably necessary for billing purposes and for compliance with Medicare and Medicaid, managed care contracts, and other federal, state, or private payor reimbursement programs or plans. (f) Evaluate, negotiate and administer all managed care contracts and other third-party payor contracts on behalf of the Practice, all such contracts being subject to approval by the Practice. (g) Provide ongoing assessment of business activity including outcomes monitoring and patient satisfaction. (h) Order and purchase all medical and office supplies required in the day-to-day operation of the Practice at the Clinics and contemplated by the Annual Budget or as mutually agreed by the Parties. (i) Provide a computer management information system, including on-site and off-site computer hardware and software license and support costs, for the provision of Billing and Collection Services. (j) Provide such other services as are reasonably necessary for the Practice to assure the efficient delivery of Radiation Oncology Services.